Does the scientific “theory” that HIV came to North America from Haiti stem from underlying attitudes of racism and ethnocentrism in the United States rather than from hard evidence? Award-winning author and anthropologist-physician Paul Farmer answers with this, the first full-length ethnographic study of AIDS in a poor society. First published in 1992 this new edition has been updated and a new preface added. 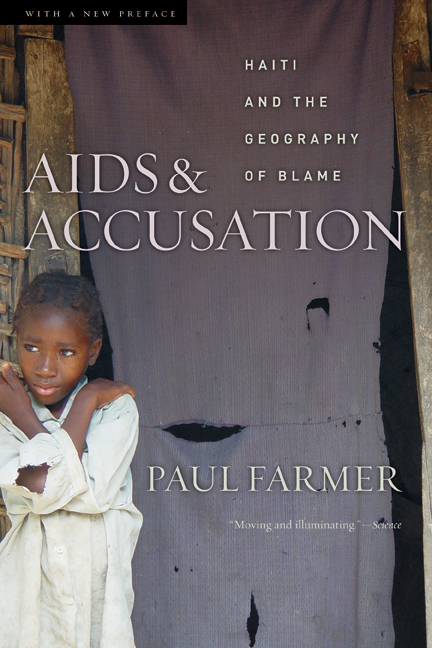 Paul Farmer, the Presley Professor at Harvard Medical School, is founding director of Partners In Health and Chief of the Division of Social Medicine and Health Inequalities at Boston’s Brigham and Women’s Hospital. Among his books are Pathologies of Power: Health, Human Rights, and the New War on the Poor (California, 2003). 10 "A Place Ravaged by AIDS"
13 Haiti and the "Accepted Risk Factors"
14 AIDS in the Caribbean: The "West Atlantic Pandemic"